15 years on the radio. 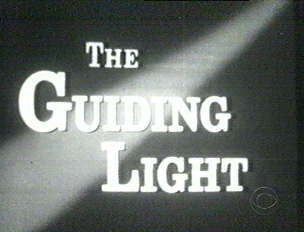 1952: Popular CBS radio soap opera The Guiding Light, on the air since 1937 (originally on NBC Radio), made its television debut on CBS-TV. The original television cast included Theo Goetz, Jone Allison, Lyle Sudrow, Charita Bauer and Helen Wagner. In the episode, Meta lamented to her sister Trudy that she had left her husband Joe and her step-daughter Kathy hated her. Trudy convinced Meta to talk to Joe on the telephone. The Irna Phillips-created show continued to be broadcast on the radio as well until 1956. In 2009, after more than 72 years on radio and TV, Guiding Light finally went off the air. The show remains the longest running scripted series in broadcast history. The episode below aired less than two weeks later, on July 10, 1952. 1966: Another World was broadcast live on the East Coast (as usual at that time) but someone forgot to tape the episode for airing in the West so the cast had to do the show again. In the episode, Hope Bauer (Elissa Leeds) asked Lee (Gaye Huston) if she could stay with Hope and Mike (Gary Pillar) all the time. Another World transitioned from live to pre-taped broadcasts on May 24, 1967. 1966: On Dark Shadows, Victoria (Alexandra Moltke) heard the sounds of a woman's sobbing emanating from a locked room at Collinwood. Upon investigation, Victoria was confronted by young David Collins (David Henesy), who had a strange and disturbing message for her. 1980: Another World introduced a new character from its upcoming spin-off series, Texas, for the first time: Striker Bellman, played by Robert Gerringer. 1980: On The Edge of Night, Molly Sherwood arrived in Monticello and realized Emily's new friend, April, was "Kirk's" wife. 1981: On Another World, Ada (Constance Ford) told Rachel (Victoria Wyndham) she thought Rachel was finally beginning to see how much she gave up by leaving Mac (Douglass Watson). 1983: On Ryan's Hope, Siobhan (Marg Helgenberger) tackled a strange man who approached her while on a job. It turned out to be her partner, Bill. 1986: On Days of our Lives, Kimberly (Patsy Pease) and Shane (Charles Shaughnessy) waited for news on their kidnapped son, Andrew. 1986: On General Hospital, Anna (Finola Hughes) was unhappy to find Duke (Ian Buchanan) having lunch with Robin (Kimberly McCullough). 1987: On As the World Turns, after making love with Margo (Hillary B. Smith), Hal (Benjamin Hendrickson) told her they would deal with the "real world" when they time came. 1999: On As the World Turns, Another World characters Vicky (Jensen Buchanan) and Jake McKinnon (Tom Eplin) met Tom Hughes (Scott Holmes) at a conference in Chicago. This was the first of many crossover appearances by Another World characters. Eplin remained with the show for three years as a contract player, while Stephen Schnetzer (Cass Winthrop) was recurring for a time in 2001. 2001: The final episode of Argentinean children's telenovela Chiquititas aired finishing a six year run. 2004: Actor Bernie Grant died at age 83. His soap roles included Dan Briskin in Somerset, Steve Burke on One Life to Live, Duke Manson in The Edge of Night and Paul Fletcher on The Guiding Light. 2005: Four-time Emmy winning General Hospital producer Carol Scott died of cancer at the age of 56. 2009: On Guiding Light, stressed about his dire health prognosis Phillip Spaulding (Grant Aleksander) visited his own grave.